Deep Space Industries has announced plans to fly the world’s first commercial interplanetary mining mission. 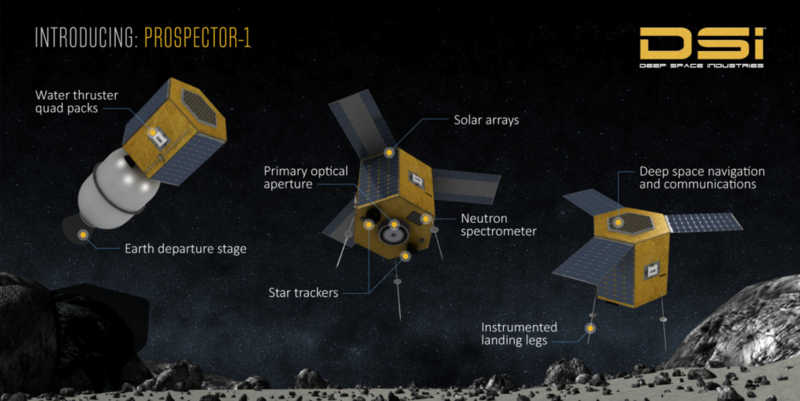 Prospector-1 will fly to and rendezvous with a near-Earth asteroid, and investigate the object to determine its value as a source of space resources. This mission is an important step in the company’s overall plans to harvest and supply in-space resources to support the growing space economy. Prospector-1 is a small spacecraft (50 kg when fueled) that strikes the ideal balance between cost and performance. In addition to the radiation-tolerant payloads and avionics, all DSI spacecraft use the Comet water propulsion system, which expels superheated water vapor to generate thrust. Water will be the first asteroid mining product, so the ability to use water as propellant will provide future DSI spacecraft with the ability to refuel in space. Along with customer missions already in progress, such as the cluster of small satellites being built by DSI for HawkEye 360, the Prospector missions will demonstrate the company’s simple, low-cost, but high-performance approach to space exploration. The Prospector platform will soon be available to government and commercial explorers interested in developing sophisticated, yet low-cost missions of their own.